Earlier this week we showed you the most adorable Beehive cake and smash cake with piped yellow buttercream texture and tiny fondant bumble bees. It was super adorable all by itself, but imagine a complete dessert table with black and yellow as far as the eye can see?!? 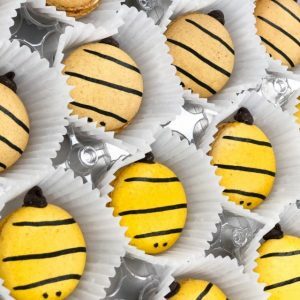 Well imagine no more because in addition to the main cake and smash cake, we also created bee french macarons and bee cupcakes! For the french macarons (not to be confused with macarOOns, which are totally different) we used our lemon and vanilla flavors…delish! We airbrushed them to give them a little more yellow and then painted black striped on them. We added little bee eyes and a black buttercream stinger to complete the look. 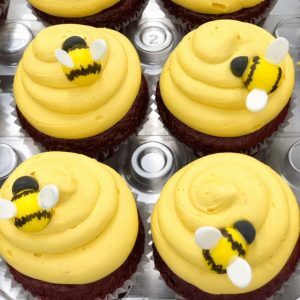 For the cupcakes, we used the same buttercream color to pipe bee hives on top and added little fondant bees. 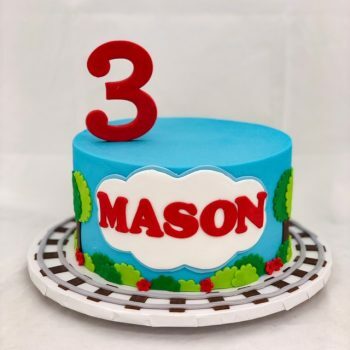 This party theme had everyone in the bakery buzzing this week. What do you think?